Product prices and availability are accurate as of 2019-04-14 08:08:06 EDT and are subject to change. Any price and availability information displayed on http://www.amazon.com/ at the time of purchase will apply to the purchase of this product. Let family, guests and co-workers serve themselves cup after cup of delicious, hot coffee from the Bellemain Stainless Steel Airpot. Both you and they will appreciate its quality, convenience and safety. Double wall construction with a vacuum between the walls keeps the heat where you want it: inside the pot. 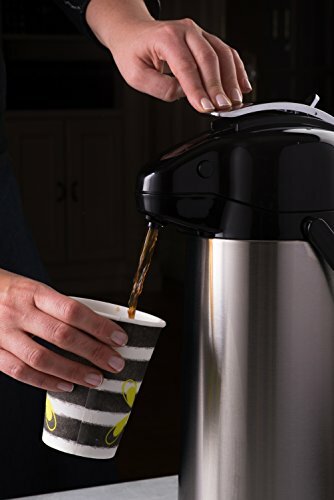 Simply brew your favorite coffee in your coffeemaker and pour it in. Vacuum insulation also prevents heat from reaching the stainless steel outer wall, so there's no risk of burned fingers. The Bellemain Airpot's inner wall is made of glass, the preferred choice of coffee connoisseurs because it doesn't leach metal or plastic tastes into the coffee. No need to struggle with lifting or tilting the pot. Just press the top lever to deliver the coffee from the spout into your cup. The Bellemain Airpot's wide mouth simplifies the jobs of adding the coffee and cleaning the pot at the end of the day. 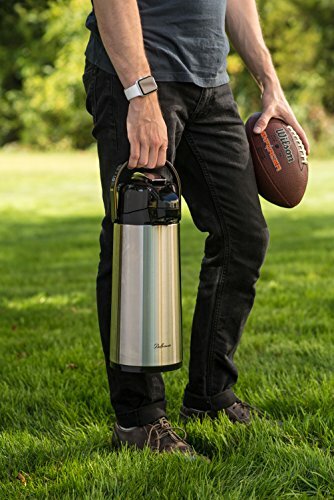 If you're transporting the Airpot to a potluck event, church social, the office or simply another room in your home, lift it by the handle for safe travels. The Bellemain Stainless Steel Airpot is designed and manufactured for exceptional performance, quality and reliability. If you're not satisfied in any way, it's backed by a full replacement guarantee. VACUUM INSULATION FOR COFFEE HOT & FRESH... ALL DAY: We think coffee should last as long as you need it. That's why we use cutting-edge vacuity insulation that traps the heat and flavour of your favorite roast: so your drink will taste flavourful and perfect, whenever you decide it's time for a sip. COOL-TOUCH | TESTED FOR ADVANCED SAFETY: This insulated airpot places two walls separated by a vacuum between the liquid inside and the outside. 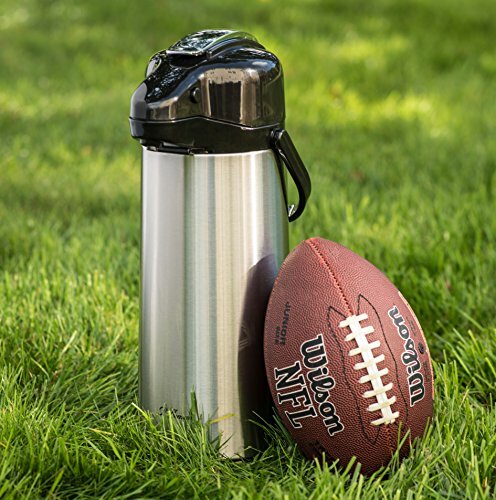 With advanced cool-touch technology, you can bring the Bellemain insulated airpot with you anywhere, and trust that it will keep your coffee steaming hot. EZ-POUR | LIFT-FREE, EASIER DISPENSER TECHNOLOGY: From filling to pouring, this insulated airpot is engineered for simplicity. Wide-mouth architecture allows users to pour hot or cold liquids without spilling a drop. Same-hand pouring EZ-pump design leaves your other hand free and removes the need for dangerous tilting. 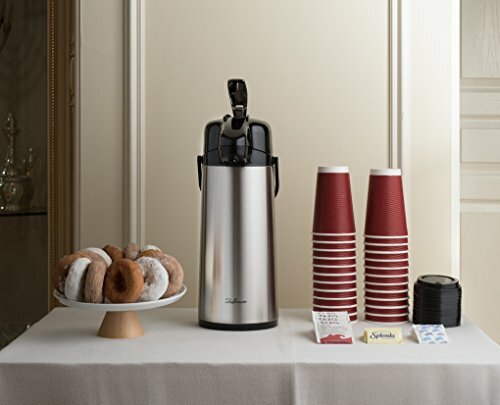 THE PROFESSIONAL CHOICE: A brushed-chrome exterior is comfortable in any boardroom or guesthouse, but this insulated airpot is also uniquely structurally solid. 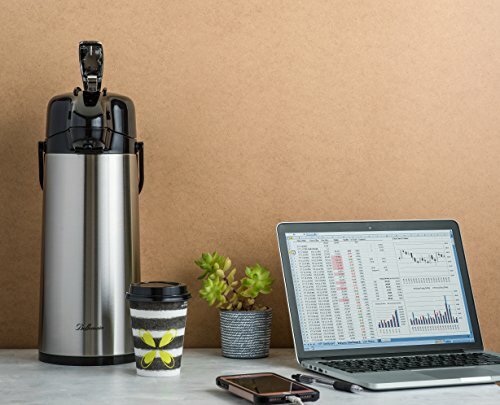 With a double-walled body made from sturdy 18/8 stainless steel, this airpot is just as comfortable in the kitchen as it is in the boardroom. MAKE IT A BELLEMAIN MORNING: OUR UNLIMITED 3-YEAR WARRANTY: We strive every day to make sure the people who buy our products come back again and again. Sometimes look-a-like products are presented as equal, but make sure you don't get burned by imposters. When purchasing this premium, genuine Bellemain airpot, we provide a full 3-YEAR ALL-INCLUSIVE warranty for all our customers.